My Investing Mission this week was to buy stocks that will be paying dividends soon. Below is a table of the stocks that I bought this past trading week. I won't be getting a dividend from one of the F and OHI shares. I bought them after the ex-dividend dates to cost average down. I also sold my 1 share of Colgate-Palmolive this week. In the equation I have "+Fee", and the reason I add the fee is because I have it listed as negative on my spreadsheet (Adding a negative, or subtracting a positive result in the same value). 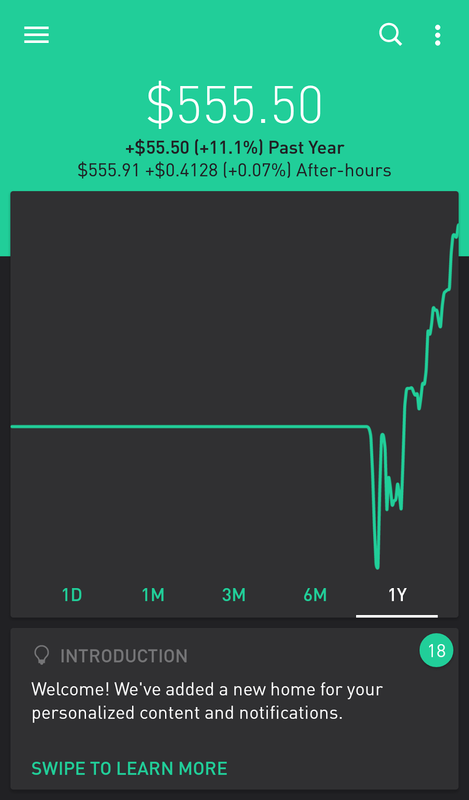 I am pumped to get an 11.82% gain on 1 stock trade. I will receive the dividend for CL on November 16th. Next week's plans will be to sell a majority of my stocks. I am going to try and sell Microsoft, Apple, Ford, Unilever, Intel, General Electric, and Omega Healthcare Investors. All of these stocks besides General Electric had recent ex-dividends or will have them this upcoming week. General Electric won't have an ex-dividend until December, so I am going to take the gains from it and buy something else. The Robinhood App is now on Version 1.3.5. The previous version was 1.2.2. The app shows 3 version updates, versions 1.3.3., 1.3.4, and 1.3.5. It looks like the biggest part of the 1.3.3 update was adding cards. You can see at the bottom of the picture below where the cards are placed at. The cards have information related to the stocks you own and information about the economy. I didn't have any cards with information about my account, but the description from the app says the cards will have that too. The version 1.3.4 and 1.3.5 updates were smaller updates containing fixes for the app. I did also notice that there is an option to send friends referrals to use the app. I'm not sure what version this updated with, but it is there now. I had been wondering if the app was going to update soon, since it'd been a while since there was one. The app doesn't need updates all the time, but it's nice to know the app is being maintained. It should be another fun week of trading next week, and I have quite a few stocks to sell. 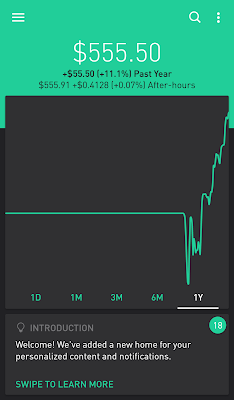 I'll have to check out the addition of cards to the Robinhood App some more too. You can look at my investing page to see my portfolio resulting from the trades this past week.